Enrique Iglesias & JonZ just filmed their Music Video Here! Fishing Creek, Log Cabin & 23 Acres, Backs to National Forest! Simply magnificent! Truly one of a kind! On a fishing creek, with a large pond, directly adjacent to National Forest on 2 sides. Stunning peak views. End of the road privacy but with easy access from county road. Perfect log home and setting most only dream of. A privilege to see! 3 Bedrooms plus a loft, 2 Bathrooms plus a laundry/mud room. Large covered deck wraps around 3 sides with awe inspiring views all around! Locked gate and long treed driveway make it feel like you are on 500 acres. Wildlife viewing (Moose, Mtn. Sheep, Elk, Beaver, and Humming Birds), snowshoeing, hiking & fishing on site are endless. Expansive views in all directions. Pike National Forest land next door has terrific treed hillsides, great trails, and summer Elk Habitat, even a waterfall! Easy to reach, just 5 miles off CO Hwy 9. 23 miles to Breckenridge (approx. 35 minutes) with famous ski and golf areas. Forty minutes away is Buena Vista with whitewater rafting. Fairplay is right next door with world famous trout fishing, historic South Park and all the services you could need. 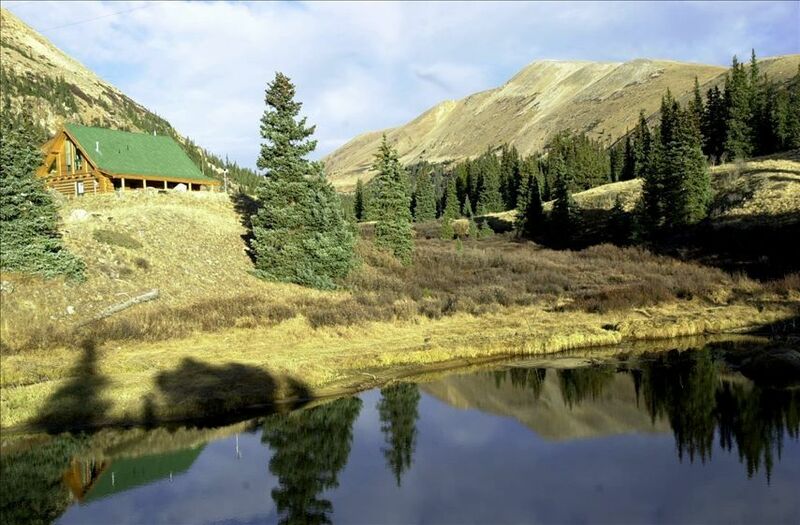 Come and enjoy an unforgettable Rocky Mountain vacation at Mountain Creek Lodge! While visiting family in the Breckenridge, CO area for summer and winter vacations, we fell in love with the area and decided it would be a wonderful place to own a second home. When we found this cabin, we knew it was meant to be. We were so mesmerized by the property and cabin, that we lost track of time and missed our plane home. We love how you feel when you're at the cabin. You're away from all the stresses of daily life without being isolated. The surrounding mountains and creeks and pond make it special. It's a place for us to reconnect with family and nature. And it doesn't hurt that there are so many fun things to do nearby! Some of our favorite activities include packing a lunch and hiking right out the door and up Mt. Sherman. It is known as one of the easiest fourteeners and the views are amazing. There is a fire pit for roasting marshmallows by the pond and on a clear night, you can see the Milkyway. Horseback riding, ATV rentals, and white water rafting are all close by. Fishing and gold paning in the creeks and pond are a favorite with the men and kids. And there's a grocery store 10 minutes away with everything you'll need for the pantry and cooking on the grill. Our favorite places to eat in Fairplay are the Brown Burro Cafe (Delicious Mexican), cheese steaks at the Dinky Dairy and everything at Millonzi's. And let us not forget Breckenridge - 23 miles from the cabin door - has everything a resort town can offer. Skiing, golfing, biking, ice skating, shopping, restaurants, tours and events.... We love it all and think you will too! Our experience at this cabin wonderful. Very scenic property, clean with lots of amenities. Everything that you would expect from a cabin. Great Get away for anyone who wants to leave the city behind for a while. This was the second time we stayed at Mountain Creek Lodge and we loved it as much as the first time. The cabin is always well appointed with every amenity you could want. The location is peaceful and beautiful. We enjoyed snowshoeing, sledding, and hiking--all on the property of Mountain Creek Lodge. Thank you, Monica and Charlie, for sharing your cabin with my family. We really enjoyed our time at the cabin--such a relaxing and beautiful place! One of the most well-stocked rentals we've ever experienced, which was appreciated. The property is a nice proximity to Fairplay, and less than 45 minutes to Breckenridge. We fished the Dream Stream and had dinner in Breckenridge, but mostly just enjoyed being on the property. We have traveled to many places, and I must say that this may have been our kids' favorite (ages 11 & 14)! The cabin wasn't fancy, but they loved the rustic-ness of it and just being in the mountains--we did, too! A wonderful place to enjoy family time. We would definitely recommend! The cabin/views are amazing. It’s very peaceful and feels like your miles away from anyone. Awesome stargazing, lots of shooting stars. Walked up the river that is stocked w/ trout. Had a moose and her baby around the cabin, which was great to watch. This is definitely a place that we plan to visit again and I would recommend to anyone. Gold Panning, Endless trails for Hiking or Snow Shoeing with views of Pikes Peak right from your property! Tour Historic South Park, Rent ATV's and travel the old mining trails.